Okay…I have been putting this off for a while, but it’s January. It’s time for New Year’s resolutions and getting your “stuff” together. I don’t really make resolutions, but January always seems to be the time when I try to do a better job of eating healthy, and I go into a completely ridiculous organizing frenzy! First, I pulled everything out of my fridge, and put “like” items together. I had bought some clear bins to organize my closet, but decided to use them for the fridge instead. I grouped foods together in the bins and put them in the fridge. I felt an immediate calm wash over me…that’s just how I roll…I feel better when things look pretty and organized. 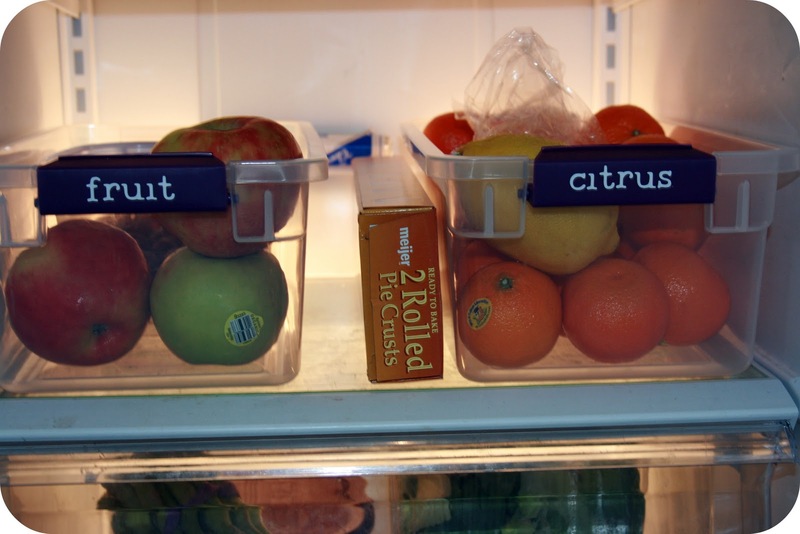 I decided to make labels for the bins and my crisper drawers with my Cricut. How cute are these? I just love that I don’t have to dig around things to find what I need. It’s also easier for Matt and the kids to find what they are looking for without yelling for me! Sadly, this is my favorite part…having all of my condiments, sauces, and dressings in order is so nice! When I am cooking or putting a sandwich together, I don’t have to look for what I need on 4 different shelves. Plus, now there is room for my bottle of wine…don’t judge, I have kids! I also took everything out of my freezer and tried to organize it. There wasn’t really room for bins, and some things had to go behind others, so I tried to think of a way to keep track of what was actually in the freezer. This is a huge problem for me, because I freeze soups, breads, and meats, but can never seem to remember what I have when I am making a menu. I usually just find whatever is in the front and go with that. So, this is my life saver! I took a chalk pen (you can totally use a dry erase marker or grease pencil), and listed everything! I put a list of what was on each shelf, and when I use something now, I can either cross it out or erase it! We have been living with our cleaner, more organized fridge for about a week now, and love it! It is much easier for me to pack lunches in the morning, the kids are grabbing fruit out of the bins, and planning our weekly menu is super easy now that I can see what’s available! 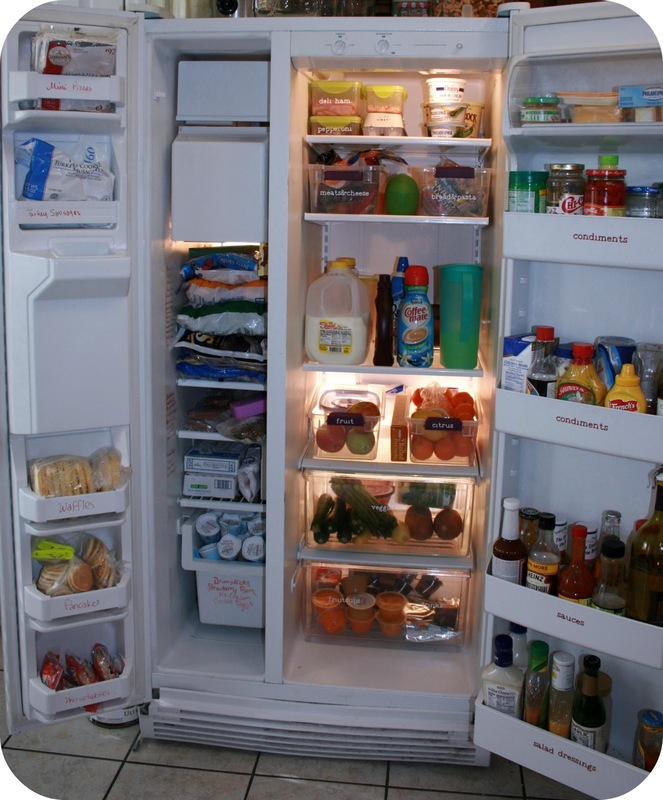 It only took about an hour to clean and organize the fridge and freezer…just do it…you will be so glad you did! Wow! You actually got me excited to organize my fridge! I love how you divided the areas into different categories and labeled them. Great idea! I’m you newest follower! Can’t wait to see what else you come up with! Stop on by sometime! Love the idea of writing what’s in the freezer on the inside. It’s so easy to lose track of freezer stuff (especially in side by sides). Last month I made a whole weeks worth of meals of stuff I had in the freezer and had forgotten about. I love it! 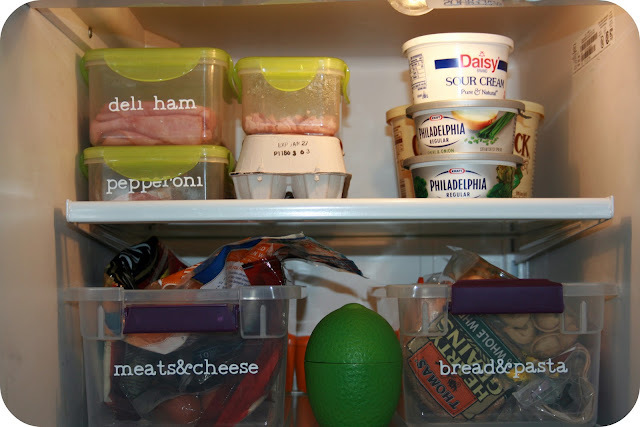 Have the same problem with my freezer and I am going to try this idea as soon as I can get to organizing it again. Looks great! I love the labels and the freezer organization. If you get a chance, I would love for you to link this up at my party, The Creative Spark, tomorrow night. Enjoy your week! 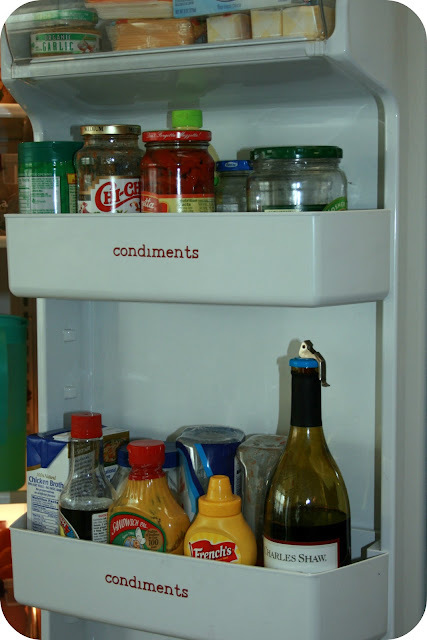 I love the idea of using a dry erase marker in the freezer! Wonderful solution to a huge problem I have! Thank you! How about you stop by my house and organize my fridge? Just kidding! What a great idea to write on the freezer wall! When everything is piled up it is hard to tell what is what. Love it but honest question? Did you leave a free shelf in the refrigerator side for leftovers? I seem to always have a large pan or pot of something that needs chilled either prior to or after cooking. How do you account for “free space” for that (and fend off your family that seems bent on filling it). I might just be inspired to clean out my fridge. Tell me, it’s been a couple weeks, how’s the organizing working? Any changes you would make? 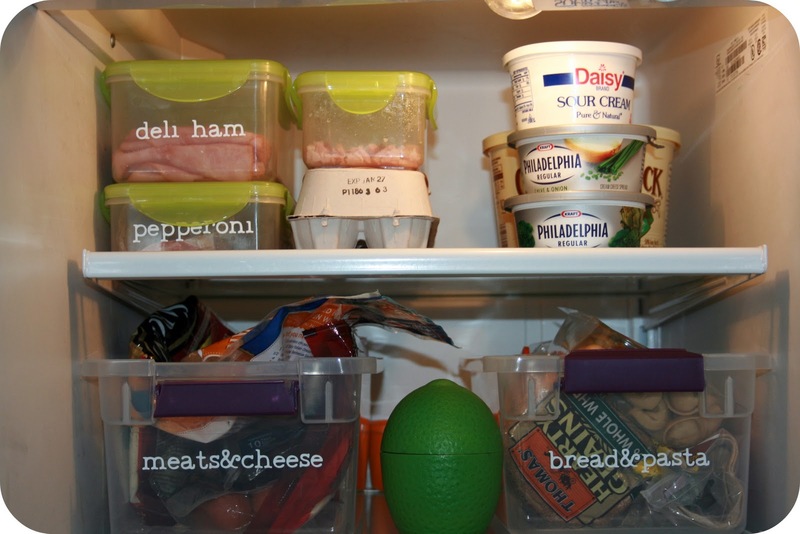 The bins are a great idea — my fridge is always like a scary game of Tetris, trying to make everything fit and not slide out as soon as the door is opened. 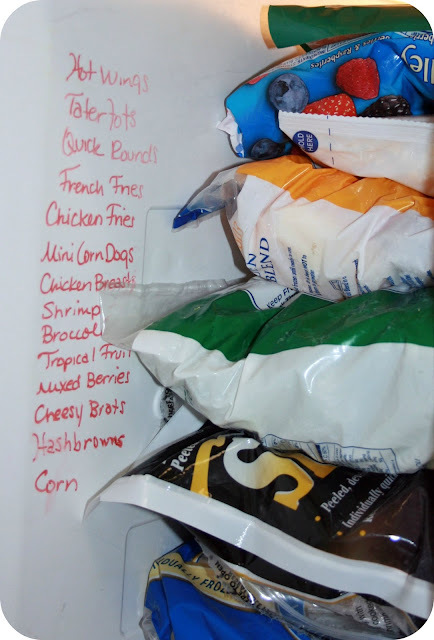 I love the dry erase in the freezer idea! Here is another tip. Cover your shelves with Glad Press ‘n Seal and they are easy to clean when there is a spill just remove the sheet and place a new one. Super simple! I also just saw that Bed Bath and Beyond has clear bins made for the refrigerator that can hold up to the cold. A lot of plastics will crack when in the cold too long. Love these ideas. I don’t like my side by side fridge but maybe bow I can improve the organization and usefulness. Thanks! LOVE the idea of writing on the freezer wall!!!! I can never keep track of what is in there!!! What about stacking stuff upright in shelf dividers? Thinking of the plastic ones for sweaters, t-shirts etc? Could that work in the freezer?